More details below the table! At the heart of the software – and a reason why Prism adds such value – is it’s unique approach to generating reports. Prism does not aimlessly crunch numbers and throw figures at you: it provides you with real insight and prompts you to ask the right sorts of questions. Whether you’re interested in occupancy, staff development, money or child tracking, Prism will give you valuable insight in an easy-to-digest format. What you choose to make a report show is dependent upon the questions you ask. •	Are you looking for general trends? •	Do you want to compare and contrast specific settings or individual children? •	Do you want to track progress or assess the impact of a change? The report you choose will often lead to more questions and if Prism doesn’t answer your question immediately, it will guide you in a logical step to deepest level until you have the information you need. Prism’s child development reports allow providers to quickly cast a critical eye over their setting’s performance. The user – at all levels – can get a clearer view of a provision (relevant to their role), pin-point an action plan and give timely intervention. Able to monitor and address any issues quickly, the reports make it easier to deliver and maintain high quality childcare to all children. 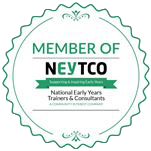 The Learning Journey report shows how an individual child has progressed against the EYFS framework. Colour-coded charts make it easy to see whether a child is emerging (yellow), expected (orange) or exceeding (green) in each of the learning areas. And, to gain more information in a certain area, a user can drill down into each learning aspect to find out more. This eliminates guesswork and enables practitioners to clearly pin point areas for development and the next steps – encouraging them to carry out more focused and quality activities that address a child’s needs and help narrow the attainment gap. “Prism’s learning journey functions are a great tool to see how a child is progressing in terms of school readiness. Practitioners can use the reports to plan for child to meet the ‘school ready’ requirements and to provide evidence to teachers that demonstrates their progress and supports their transition. The rationale of providing immediate insight through easy-to-read reports alongside the ability to drill down in detail applies also applies to analysis on a group level. For example, you can look at the overall progress of a cohort, such as a room or age group. You can then drill down to find out more about the cohort’s progress in a specific learning area, before drilling down even further to look at individual children too. The comparison option will allow you to compare different cohorts, such as boys and girls or funded v non funded children. The initial graph will help you make a quick initial analysis and, based on the results, you will be encouraged you to ask questions in the same drill-down manner. You may, for example, notice that girls outperform boys in writing. You can question why, investigate quickly and plan accordingly. You can also analyse sub-groups too. You can use simple criteria, such as Boys with SEN, or you can include or exclude multiple criteria to find even more powerful insight. For example, an older child who is further along their development journey than younger classmates may skew the results (by raising the overall progress), thereby concealing indication of the class’ true progress. Another child tracking feature that is particularly useful is the timeline option. This report allows you to compare a snapshot of a child or a whole cohort’s progress between different times (up to four at once). Information is presented, initially, as a line graph to give you a clear picture of progress and allows you to assess whether your provision is helping children to progress. Once again, you have a range of filters to choose from and you can drill further down to answer any questions you have. •	Practitioners can look at a specific child or small group to ensure that what they are planning is adequately allowing them to meet their learning goals. •	Mangers can quickly see whether a whole cohort is making progress – which again can include specifically tracking vulnerable learners. •	All users can see how effective their action planning has been. For example, you can see if a focus on a particular aspect of training has made a positive impact on practice. The home screen dashboard empowers your team by providing them with all the information they need at a glance. All the useful information that they require about their key children, schedules, attendance and punctuality is visible, along with important colour-coded prompts with respect to child development. If there’s something they need to pay attention to, it’ll be flagged up clearly in red! When your team know what’s expected of them and can quickly access more information to help them do it – they’ll be empowered to deliver without relying on you for instruction . LINK: Read more about empowering your team with Prism. This functionality helps providers make sure that they are using their most important resource (people) as efficiently as possible, but not at the expense of children. Managers can access in-depth work performance reports that can be used to help individual and team members develop. The reports show how staff have utilised their time and can help line managers to focus their attention on developing team members’ areas of weaknesses, based on the reflective performance as shown by the system. As the team become well-rounded rounded practitioners, they will be better equipped and able to provide improved quality of care. As such, this functionality has the most potential for early years managers and owners. “The reports are useful in a lot of ways. As a manager, I’m not on the floor the while time, so the reports are an invaluable indicator of things I need to investigate further. Equally, when my instinct as an experienced earl years professional alerts me to a potential issue, I can probe the system to see if I’m correct. It’s proven to be valuable when liaising with outside agencies for SEN children or when trying to make referrals such as CAF. We suspected one child had autism and we were able to submit the reports as evidence as part of the CAF process. We’ve also used reports as proof for EYPP money, because it can show how an individual is developing and making progress. This functionality allows practitioners to record all activities that a child has taken part in during the day, but it is more than a simple ‘logging’ facility. After a practitioner logs that a child has taken part in a certain activity, Prism shows the practitioner where that activity links to the EYFS and what skills to look out for. It also demonstrates how the progression of an activity from baby room to preschool can also be seen in a sequential way. Therefore, Prism acts a training tool. This is a core development area that we think can become even more effective, including links to ‘associated groups’ and to identifying ‘key skills’ and ‘associated skills’. Daily diaries can then be sent to parents via e-mail or accessed through the Parent Portal. This feature is more useful when linked with the Parent Portal functionality. •	photographs (with relevant permissions). The portal improves communication between your team and parents and engages them with their child progress – while significantly reducing the amount of time spent on administration. Prism replaces paper-based administration work with digital technology that makes your team’s life so much easier. With all your data entered on Prism, you can let it do all the hard work for you, such as number crunching and generating invoices. All the information is to hand whenever you need it, including child and parent details, waiting lists, staff scheduling, child scheduling, invoicing, reporting, food & menus, daily diaries…and so much more. This means that you can get back to the important work that helps improve the quality of childcare and your reputation. Want to know what you're missing? 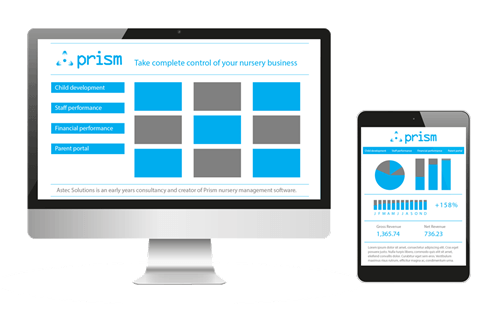 Drop us a line to find out how Prism can help you improve childcare quality and boost your business.